There was minimal progress with harvest in the Northwest Region this past week due to continued cool wet weather. Daytime temperatures were down into the single digits with nighttime temperatures dropping well below zero throughout the entire region. Precipitation amounts were just enough to slow down the harvest with strong winds bringing in rain and snow over the weekend. 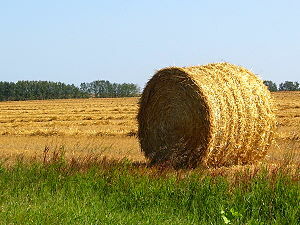 The crop in the northwest region is estimated at 80 to 85% harvested. The spring wheat crop is mostly harvested throughout the region with the exception of some later seeded fields that remain standing. Yields are good ranging from 65 to 85bu/ac. Fieldwork and anhydrous applications are taking place as conditions allow. The wet weather continues to be challenging for producers trying to combine their canola crop. Any canola harvested this past week came off tough or damp and will need to be dried down for storage. Around Swan River the canola harvest is about 70 to 75% complete with yields of 45 to 60 bu/ac, canola is yielding 50 bu/ac in the Roblin area. Harvest operations at The Pas were well underway through the week until a heavy snowfall event on Saturday brought the harvest to a halt. Areas that have received snow are reporting damage to standing canola fields. The lentil and pea harvests are complete with yields of 45 to 50 bu/ac and 50 to 70 bu/ac respectively. Harvest of soybeans is started in the Northwest Region with reported yields of 40 to 45 bu/ac. With the additional snowfall on the weekend, producer concerns remain about getting forage such as second cut feed, swathed greenfeed and straw baled up. A narrow window of better weather earlier in the week around Swan River did allow producers to bale up some second cut forage. Herds continued to be moved to extended grazing pastures and those still remaining on summer pasture are being provided supplemental feed. The majority of corn silage harvest in the region has been completed.